Three of my besties are moving into new places, and I thought candles would be the perfect housewarming gift. 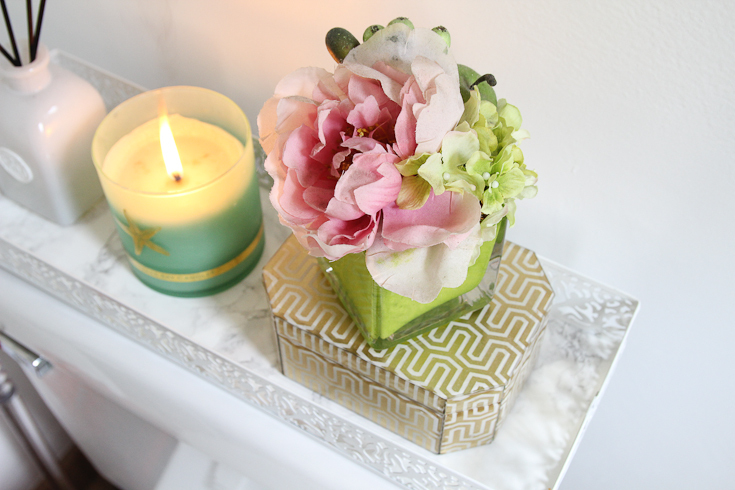 Candles are one of my favorite decorations- they are beautiful and functional! 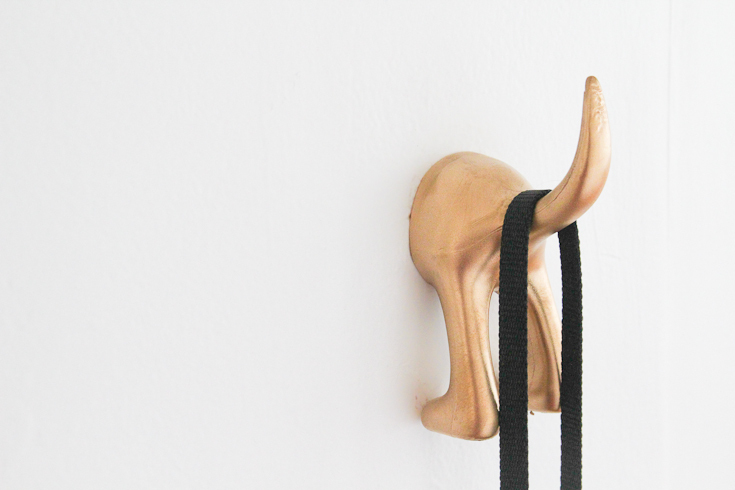 Like most other things I like, I set out to DIY it. I wanted to start basic, so even though this pin looks amazing, I opted to try basic pour candles. I ordered wax and wicks on Amazon- hooray for Prime- and when it arrived I had to laugh at how giant 5 lbs of wax actually is! Steve thinks I’m crazy. I melted the wax down in the microwave for two minutes, and mixed in Gardenia scentI also purchased on Amazon. Gardenias are one of my favorite flowers. My grandmother has a gardenia bush outside of her house and she would pick one for us to have on the road when we left from visits. The smell is so distinct and sweet, and reminds me of her- I love it! I decided not to add any color to the wax because gardenias are white, and because they are gifts so I wanted to keep them color neutral so they worked in my friends new homes. If you want to add some color, the easiest way is to add some crayons. Literally- grate up that old Crayola and toss it in the wax until you have the desired color! After your scent and/or color is mixed in to the melted wax, set the wick by putting a little wax on the bottom and sticking it to the bottom of the container. Ideally you can let it dry enough to hold steady before pouring the wax in. 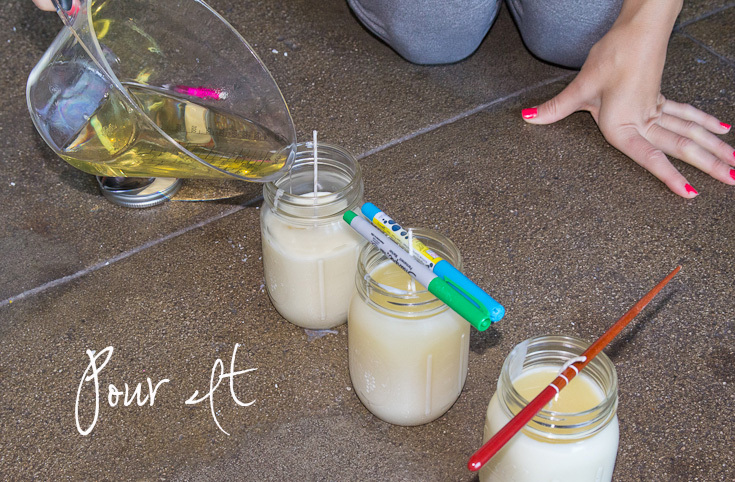 After you have poured to the desired depth, center the wick and secure it in place with whatever you have around the house- pencils, chopsticks- anything to keep it from moving. Then it’s a waiting game. Once the wax dries you may get a little sinkage around the wick. Not sure if sinkage is a real word- but I’m going for it. Just pour in a little more wax on the top and it will cover it up nicely. Then cut the wicks to the desired length, and enjoy your homemade candle! Hi, how many candles does 5 pounds of wax make? Hi Samantha. I was able to make 6 mason jar candles. It will of course depend on how large your jars are. 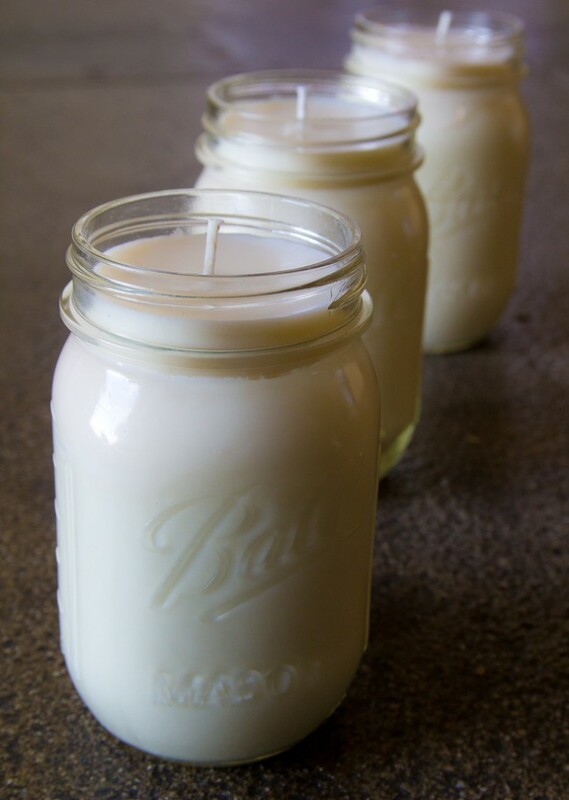 Each pound of soy wax is equivalent to 18 ounces when melted. 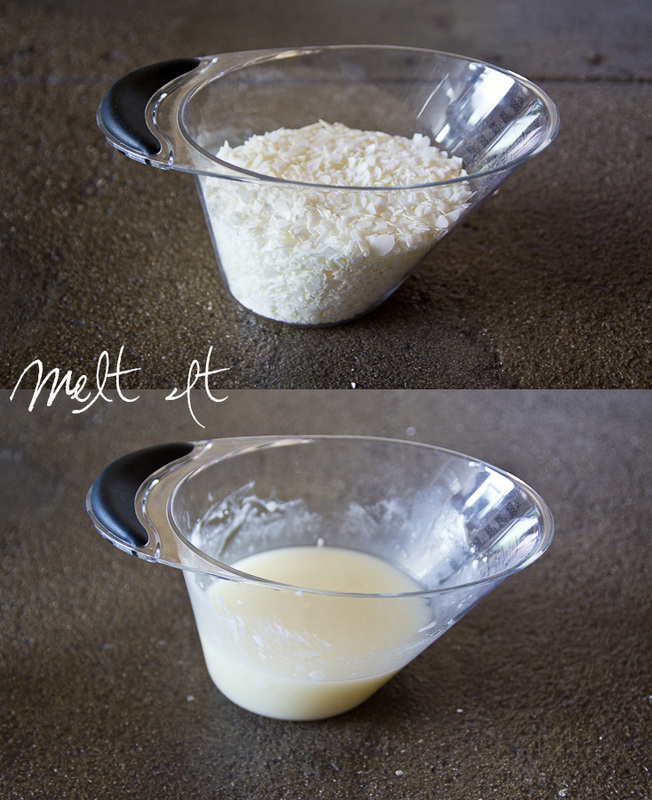 So you will end up with about 90 ounces of melted wax to fill containers as you please! Happy candle making. 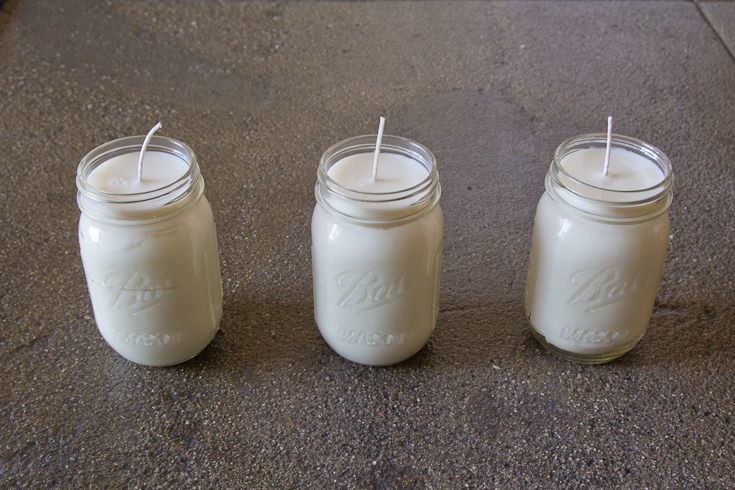 What kind of wick did you use for the mason jars? Can you please link me to the wax and the gardenia scent on amazon? Hi Sarah, absolutely. I added links in post above so you can click through. Enjoy! Hello! How much of the scented oil did you have to add to the candle to actually make it smell good? I would love to know this too! Was very curious how much oil was put into your candles? I used about half an ounce of scent. General rule of thumb is one ounce per pound of wax- but you can go up to double if you really want to smell up the place! I wouldn’t recommend using over 1.5oz per pound all waxes aren’t made the same some can hold it and some can’t. You need to check with your supplier if you don’t know. This is awesome! Do you add in the colour and wax crayons once the wax is melted? Or do you add in the crayon wax while it’s melted, and then stir in the scented essential oil once they’re both melted and mixed together? Hi Laura! I grated up the crayon and added it to the wax before I melted it. Once the wax is melted then you stir in the scent. Good luck! Hi Laura! Sorry for the delay in response- my Disqus was acting up. I added in the wax crayons with the unmelted wax and microwaved them together. After the wax was melted I added in the scent. what if I don’t have a microwave… how would you suggest I melt the wax. I know on the stove but will it ruin my pots if they’re non stick? Hey! Did you use the whole bottle of scent for your 6 candles? Also, did you mix water or something into the scent before pouring it in? Hi Sidny! Yes I did. You can play around with the amount though depending on how strong you like it :) In general for a medium scent use one ounce of scent for one pound of wax. Hey there. Yes I did use the whole bottle, but did not mix in any water. The amount of scent really depends on how strong you like your candles to smell. In general use about one ounce of scented oil per pound of wax, but feel free to play around to find out what you like best. Any advice as to why when I light my candle, the flame is so low and barely burns? How much essential oil did you use for a single candle? I used about half an ounce per candle. Depends on how strong you like the smell! WAs it essential oil or candle scent you used? These are fantastic! I’m planning a girl’s night and would like to make them soon. Do you know how long it took for the jars to dry? Just wondering if it’s doable for the time we have or if I need to make them on my own! Great idea! They take a few hours but after an hour it should be firm enough to transport safely. Have fun! What size mason jars did you buy? HI! What size Mason Jars did you use? Pint Size? This is kind of a silly question to ask, but the container you melted the wax in was glass right? Not a silly question at all. I used a measuring cup that was actually plastic. Just make sure it is “microwave safe” before hand! How much did the wax cost? 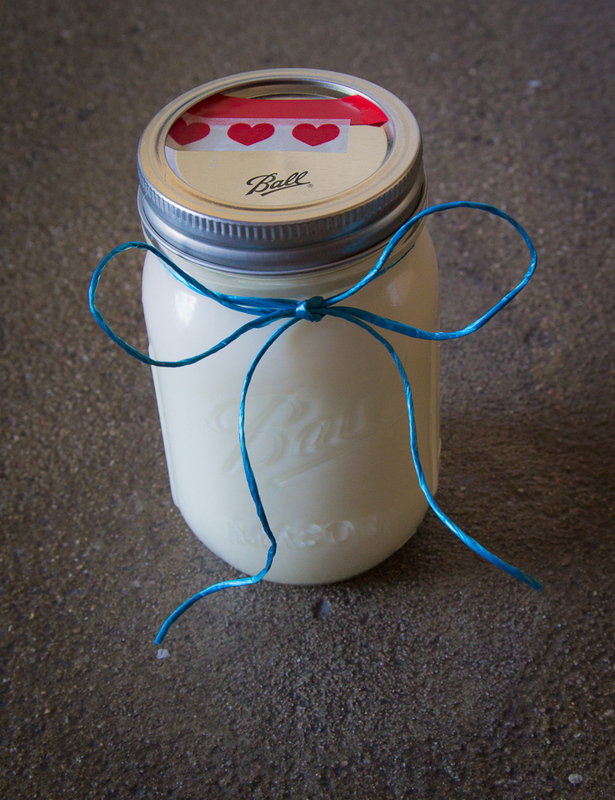 :) I’m thinking of doing some party favors for a bunch of people, and wanted to use the tiny “squat” mason jars. How much would you recommend using for fragrance to wax ratio? You can also hot glue the wick in before you pour the wax in. This helps insure it does not move. Using crayola crayons to color candles is not a good idea. There are coloring agents specifically made for candles. Crayons will give off toxic fumes when being burned, they are not made to be used as candle colorants. In addition to the toxins, they tend to “clog” the wick, and your candle wont burn properly. Wholesale candle stores sell a candle color block for less than a dollar. Craft stores may be slightly more, but not much. Depending on how dark you want the candle, most blocks will color around 20 pounds of wax. Question: how long did it take to “dry”?? Have not made candles since I was a young girl (we won’t say how long ago, but dinosaurs were still roaming the planet!!). These are a wonderful idea!! Christmas gifts for friends who prefer real scents instead of the odd blends they use today! 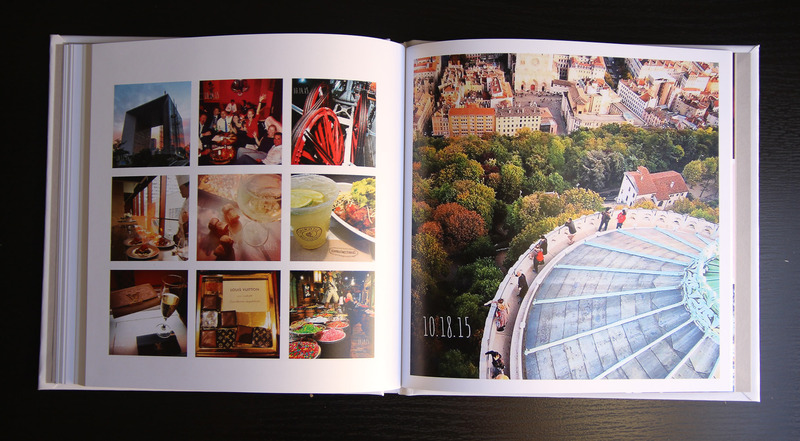 Thank you for posting this perfect gift idea!! I’m not crafty at all but I’d love to make these. What is that oil looking liquid your pouring on top of the wax? 6 mason jar candles. Each pound of soy wax is equivalent to 18 ounces when melted. 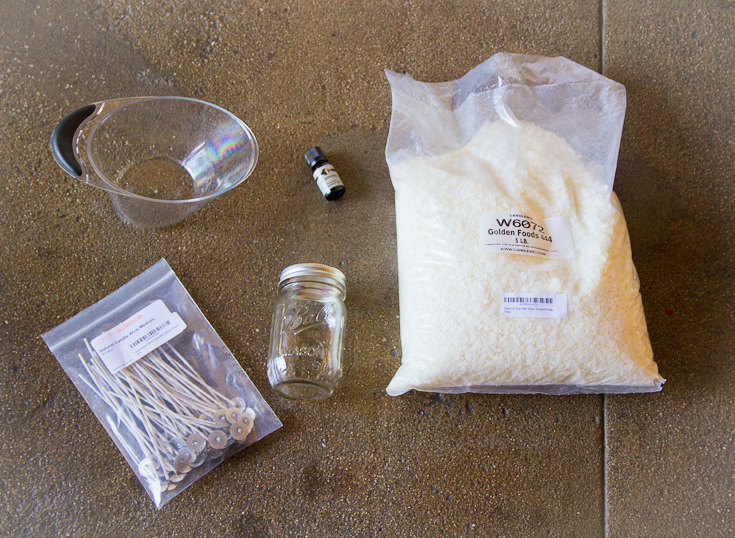 So you will end up with about 90 ounces of wax with the 5lb bag, and then it just depends on how large the containers are you chose to make your candles. How many cups of wax did you use to fill your mason jar??? How many things of scented oil did you have to buy and what size mason jars did you use? If I wanted to make only one or two, how much wax and fragrance should I use? Can you put food coloring in the wax to make them in color? No, food coloring is water based so it won’t mix well!